Promising you a Rose Garden - Face Serum, is a miracle worker for your skin. The serum is made with sweet almond oil, pure rose oil (rose absolute) and calendula extract. The serum is rich in essential fatty acids, vitamin E and antioxidants that are essential for the health of your skin. They help restore your skin and stimulate the healing processes of the skin. Helps reduce wrinkles and scars and is very suitable for dry and sensitive skin. But above all, this oil smells heavenly, as if you're taking a stroll through a rose garden! Promising you a Rose Garden comes in a small glass bottle with a dropper. Handy for traveling! Our face serum contains pure rose oil. Rose oil contains essential vitamins, minerals and antioxidants and has soothing properties that contribute to the hydration of dry skin. 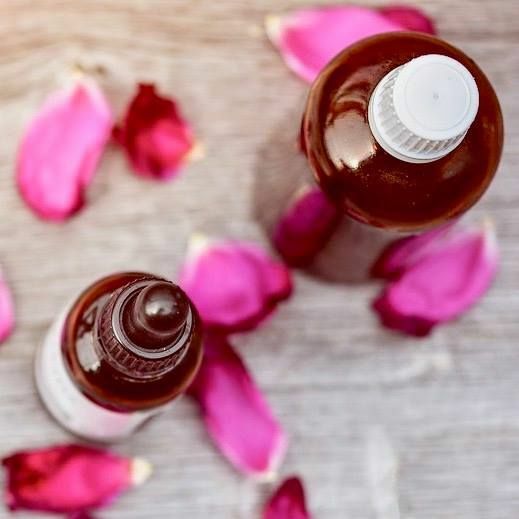 Rose oil also offers antiseptic and toning properties that help treat acne, as well as anti-inflammatory properties that help treat redness and inflammation. 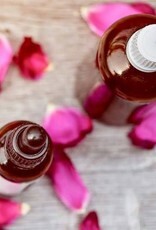 Rose oil can also help refine the skin structure and help skin diseases such as psoriasis and atopic dermatitis. But the smell of rose oil does something too! Not only does true rose oil smell delicious, but the smell also reduces feelings of stress! If you smell real rose oil for the first time, you will be amazed by the smell. This is because you often get a wrong impression because of the many cosmetics and perfumes with rose fragrance. Real rose oil smells overwhelmingly amazing! Sweet almond oil (Prunus Amygdalus Dulcis oil), Rose Absolute Oil (Rosa Centifolia Flower Extract), Calendula (calendula officinalis).